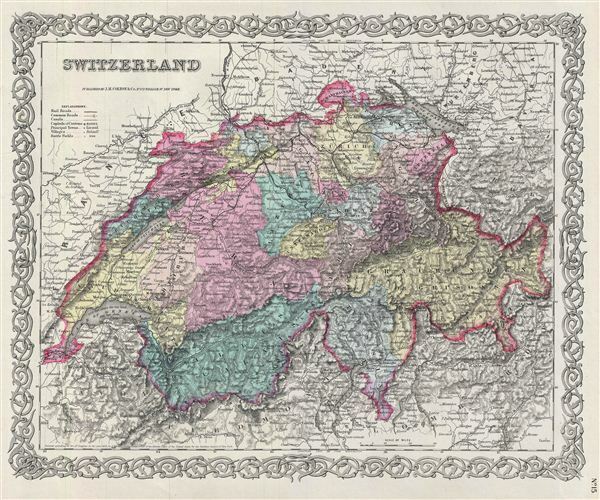 A beautiful 1855 first edition example of Colton's map of Switzerland. Like most of Colton's europe maps, this map was derived from an earlier wall map of the World produced by Colton and D. Griffing Johnson. The map covers the entirety of Switzerland divided into its constituent Cantons from Vaud to Grisons. Parts of adjacent France, Germany, and Italy are also shown. After the creation of a federal constitution in 1848, Switzerland underwent a rapid social and economic development. The cantonal currencies were replaced by a single currency (the Swiss Frank) and many of the cantons subsequently established representative governments and instituted freedom of the press and trade. This map also identifies various cities, towns, villages, railroads, canals, rivers, rapids, mountain passes, and an assortment of additional topographical details. It also identifies battlefields, including the battles of 1798 in the canton of Schwyz during the French Revolutionary Wars. Map is hand colored in pink, green, yellow and blue pastels to define canton boundaries. Surrounded by Colton's typical spiral motif border. Dated and copyrighted to J. H. Colton, 1855. Published from Colton's 172 William Street Office in New York City. Issued as page no. 15 in volume 2 of Colton's 1856 Atlas of the World.